Three Phase Double Wound Transformers. L.T. Current Transformers are manufactured both in natural air cooled construction and natural oil cooled construction. In addition to the above other types of transformers are i) Voltage Auto Transformers ii) Current Transformers. These are described in our various leaflets. Special Enquiries will always be entertained with promptness, by our Engineering and sales staff. The transformers described in this catalogue are made in natural air cooled and oil cooled construction, suitable for indoor use in a maximum ambient temperature of 45oC. 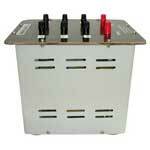 The electrical performance of these transformers generally confirms to the requirements of I.S. specification No. I.S. 2026 for power Transformers. 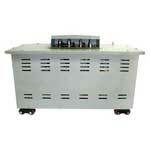 Natural Air Transformers are supplied in sheet steel ventilated case with screwed top cover. Input and output terminals are provided on the top of the transformer, inside the casing. The transformers are suitable for floor mounting and are also supplied with M.S. rollers for easy portability. Natural oil cooled transformers are supplied in M.S. Tanks. As a standard practice the tank is provided with oil filling hole with cap, oil level indicator drain plug and earthing terminal. Input and Output terminals are brought out generally on the top side of the tank. Extra off-load taps can be provided on request. The capacity of the transformer at the tap will be proportionately low corresponding to the tap voltage. The declared capacity will hold good only for the highest voltages on both input and output, unless the taps are specified as full capacity taps. These generally are manufactured in Delta/Star or Star/Delta connections. Extra off-loads can be provided on request. A typical vector with winding connections is as shown below.